If you haven’t been following American or Canadian news lately, you might have missed the terrifying mainstreaming of nazism and hatred that’s occurring in the US right now. Though racism, anti-Semitism, homophobia, transphobia, sexism and general hatred has always existed in very scary ways in the US, for the first time in my life those beliefs and actions have been publicly supported by the President of the US and the administration – in plain language. Hateful people wearing swastikas and carrying torches have been gathering in American and US cities and causing damage, injury, and even death. I’m frightened, angry, and disgusted with the complacency. This can’t happen. This certainly can’t happen AGAIN. Like an evangelical watching for signs of the rapture, many have been comparing these events to the events leading up to the Holocaust in World War II and predicting a similar outcome. I can’t say I blame them. The bystander effect is real. Internalized racism, sexism, homophobia all of that is REAL. Even white and privileged people who don’t consider themselves racist or hateful often unconsciously see people of colour and other marginalized people as other or less than. In the event that something should befall one of our brothers and sisters of colour, or that they are attacked, I honestly don’t have the faith in the average person to protect them. If you have been paying attention I’m sure you share my fear and outrage. I’m sure you share my desire to do something. Showing up to counter protest isn’t possible for everyone, nor is it necessarily safe. That being said, sitting at home and doing nothing is just not an option. No matter how much sheetcake you cry into. 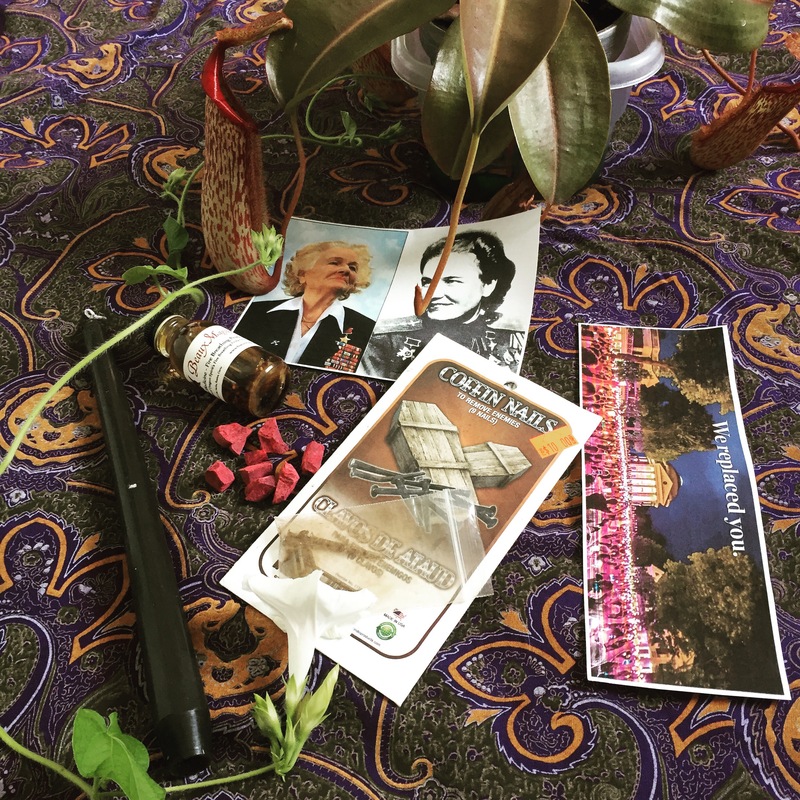 In addition to baneful magick, a few online witch friends including Aurora Moone from Plentiful Earth created this incredible spell for protection, equality, and coexistence that they’ll be performing during today’s eclipse. To properly use the energy of this eclipse, I believe it would be most beneficial to have both Sun and Moon energy working together. While those who perform the Lady Liberty Spell (or any other that would be deemed “light” magick) will be casting love and light on those who are being hurt by hate, those of us casting the curse will be the dark and hidden energy of the moon. We’ll work with the shadow elements of this problem. The inspiration for this mass action and my spell comes from The Night Witches or Nachthexen, a Russian bomber squadron who carried out various, incredibly dangerous, attacks on nazis during World War II. They would idle their engines and quietly glide by the Nazis, making only the sound like a witch on her broomstick. This small regiment used training planes, wore hand me down uniforms, decorated their planes with flowers, and were often disrespected by other soldiers and officers. They were so feared by the Nazis that any successful attack of one lead to an instant Iron Cross. This Monday we’ll be calling on the strength of these brave soldiers who made incredible strides in the war and struck supernatural fear into the hearts of Nazis. If it’s something you do in your practice, maybe try to call on the spirits of some of the Night Witches and ask them to lend their strength and determination to the working. Here is a profile of one of the most famous from the Regiment, Nadezhda (Nadia) Popova, upon her death in 2013. So here’s the thing – I don’t like telling you witches exactly what to do. Everyone practices magick differently, everyone has their own style, own ingredients, own prayers and spirits and deities. I can’t possibly write a single spell that will work for everyone. Not only that, but I don’t think it’s necessary for all of us to do identical magick to be working toward a common goal. I think as long as we all have similar intentions, our magick will work together. We’re all connected. The one thing I will hammer out in plain detail here are my intentions with this spell I am performing. Otherwise, this is just an overview of what I’m doing and what I’m working with, along with some ideas you can use. If you have all of the things I mention here, please feel free to use the spell! I want to be clear, you don’t need ANY stuff to do a spell. You can just focus your intention and do some visualization. It’s up to you. I like stuff. I’m doing a candle spell using oils, incense, and some live herbs/plants I grew myself. Anointing oil – I’m using Dragon Medicine oil from Beaux Magique. Not only do ancient legends about the eclipse often equate the sight with a dragon coming to devour the sun, but this oil is used for change, consciousness, recognizing danger, dispelling darkness, and destroying the old to make way for the new. Perfect. You could also use something like black pepper oil, a van van or anything else that spells DISASTER. Baneful herbs and plants with which to dress your candle – my ingredients here will be a bit unique. I am using a large pitcher from my Nepenthes plant, and a morning glory vine. I’ll probably also go outside and pick some nightshade flowers. You could use black pepper, tobacco, cloves, cayenne, rue, or anything else that seems to work for banishing, destroying, poisoning, ruining, or cursing. Think aggressive. Grab some thorns or thistles, or cactus spikes. Incenses and Powders – again to dress your candle or burn on your altar. I’m using dragon’s blood resin, you could also use cemetery dirt, palo santo, clove, banishing incense, Hekate incense, or make your own! Since I’m using one of my pitchers (the most beautiful one, ugh, I’ll miss it) from my Nepenthes plant, a lot of my spell focuses on narrowing the influence of Donald Trump, Neo-Nazis, Breitbart news, etc to that of a tiny fly. From there I’ll be writing their names, and the name of other hate groups and movements and ideals, rolling them into small balls, and putting them inside the Nepenthes, trapping their disgusting ideals from damaging others, while being surrounded and trapped in the sticky trap of hate they’ve created for themselves. Finally they’ll be eaten alive by their hate, wither and die, and leave the world a better and more fulfilled place. The rest of us will feed off of their destruction and grow, just like these carnivorous plants. Narrow the influence of donald trump, and all hate groups who draw strength from his presidency, to that of a single, tiny, fly. Contain their hatred so it can’t affect others, either negatively or positively. Bind them with their own hate. Return all hateful words and actions back at them, and allow that hatred to consume them. Cause them to weaken and wither the further into their hate they delve. Bind them from reaching out to anyone. Keep them alone, separate, powerless. Let them know they don’t belong in our society. Make their views unacceptable. Take away their sense of community and leave them alone with their pestilent hatred. Bring to light the secrets of their hate, and allow those who support hate to see it for what it really is. Make way for a new era free of hatred and bigotry. Create space for a new administration, a new standard of tolerance, acceptance, and respect for all, and new legally granted rights and freedoms for the oppressed. Carve and dress the candle. You can carve symbols, names, word or phrases. Focusing on trapping and binding hatred in one place. Anoint the candle from the top to the bottom with the dragon medicine oil. Imagine a dragon coming down and wrapping itself around the candle, bringing with it all of the hatred it’s found in the world. Dress it with herbs, powders, or resins. Make sure there is water at the bottom of the Pitcher, if not spritz and water the plant and wait a bit. Select the largest and most sturdy pitcher and harvest it. Place your candle into the opening of the pitcher, leaving space around to add things. Write down the names of hateful people, systems and ideals on small pieces of paper, focusing on them as you do. Ball them up and trap them inside the pitcher, like insignificant flies. You can also add baneful hers or magical ingredients for extra poison here. When finished, wrap the morning glory tight around the pitcher to close it, focus on your intentions, and light the candle when the eclipse is at its peak and the moon and sun’s energy are working in tandem. Allow the candle to burn down into the Nepenthes (watch for fire) and when it’s done wrap it in a paper bag, and bring it to a sight that perpetuates this hatred. A rally, a statue, a landmark, a political building, etc and leave it there as a message that hatred will not stand in our world and our society as long as we have any say in it. I know this is incredibly specific, but if you want to do this spell without the Nepenthes, why not use a mason jar with water and a sticky substance that attracts insects? Then add a lid and maybe some pieces of morning glory and other baneful herbs. Throw in the balled up papers, or even photographs and pictures from the news paper. What I’m doing is essentially a candle spell that creates a witch bottle, but my bottle is a leaf. You could also use the candle on its own and use moth and flame imagery instead. 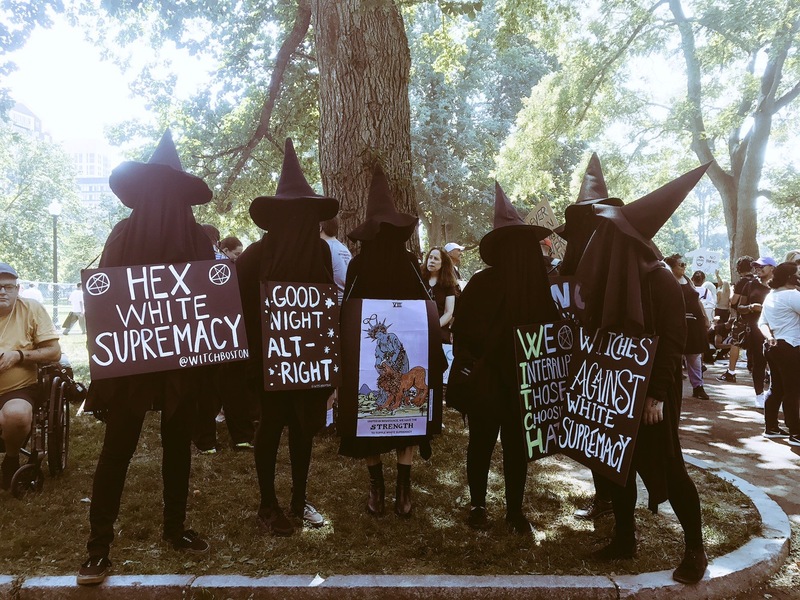 For a more classic curse written by a really powerful witch, consider using this one, written by Melanie Hexen to Hex Brock Turner during a mass hex last year. Add in anything you have that lends energy, crystals like onyx and jet and obsidian; tarot cards like the tower, judgement, strength, and death; a broom with which to cleanse them from this earth, whatever feels right. My facebook event starts at 2pm EDT because that’s when I’ll start creating my items, and around 2:37 the eclipse will reach its peak and I’ll light the candle. Feel free to participate anytime the eclipse is visible, or even later at night during the new moon. The new moon and the eclipse are linked in energy and this strong energy regarding change will be here for a while. Like any other magick, it’s really the thought and intention that counts. 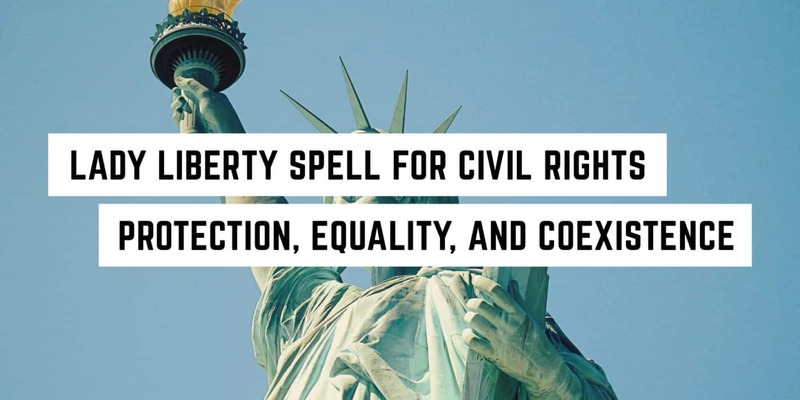 If you can’t cast a full spell because you’re working or busy, maybe just take a minute during the eclipse to focus on either some fo my intentions, or the ones outlined in the Lady Liberty Spell. Everyone’s magick is welcome, and needed at this time.